Running along one wall of the Bully Boy distillery is a shelf that holds a collection of dusty, empty liquor bottles. 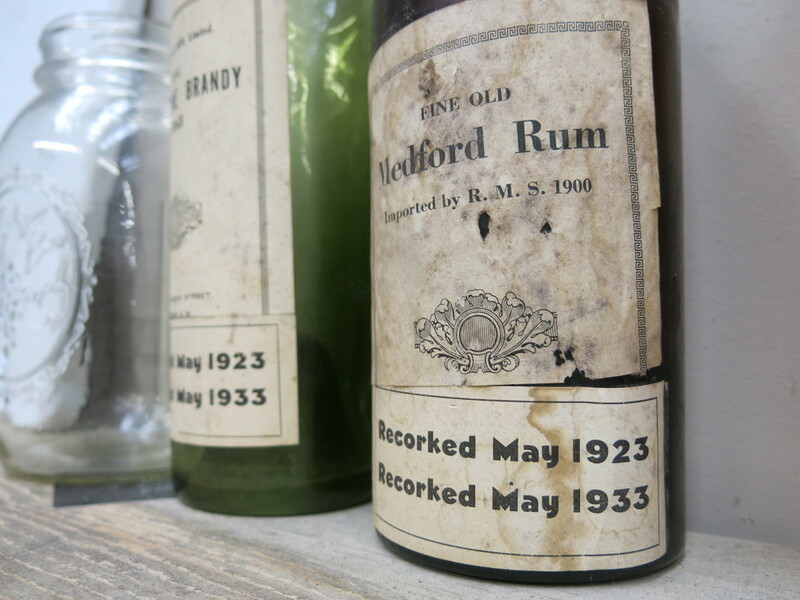 The labels – faded, smudged, and grimy – advertise dubious contents such as “Very Old Cow Whiskey” and “Pale Brandy.” A “Fine Old Medford Rum” looks anything but fine, though it’s definitely old. Even familiar brands like “Bacardi Rum” are a little suspicious when their names are typed onto ordinary household labels. 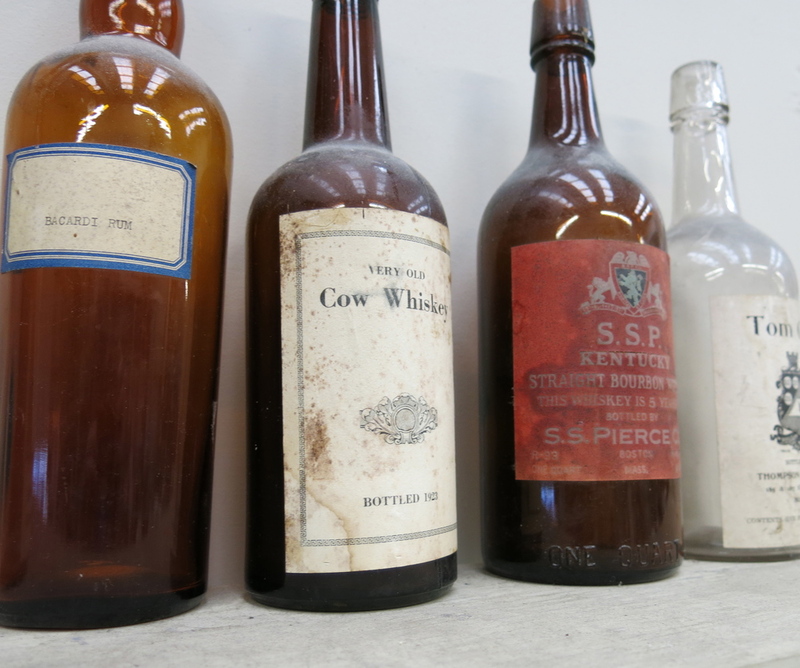 A closer examination of those labels – particularly the dates, which stretch back to the 1920s and 1930s – reveals why the names are so unusual and the contents so questionable. This was bootleg liquor. In an era when Prohibition is endlessly glamorized and so many bars try to recreate the experience of drinking in a speakeasy, these bottles are the real thing – a tangible, authentic connection to a period of American history that mystifies and fascinates us to this day. 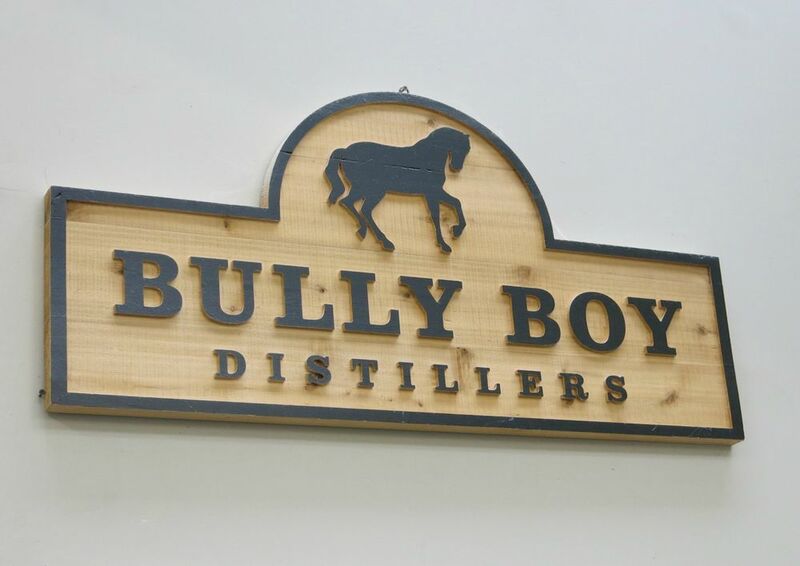 But to brothers Will and Dave Willis, owners of Bully Boy Distillers, the bottles are more than just artifacts. You might say they’re family heirlooms. The bottles once belonged to the Willises’ great-grandfather, who locked them away in a vault on the family’s farm in Sherborn, Massachusetts. Will and Dave discovered the vault in the basement of their farmhouse when they were kids, but it would be some time before they appreciated the significance of their find. And while there’s no evidence that their great-grandfather had any role in making the hooch, there’s little question that his farm was the place to be back when booze was banned. What they’re doing is making a line of small-batch spirits that have fed consumers’ demand for artisanal liquor and given bartenders a slew of unique options for creating innovative cocktails. 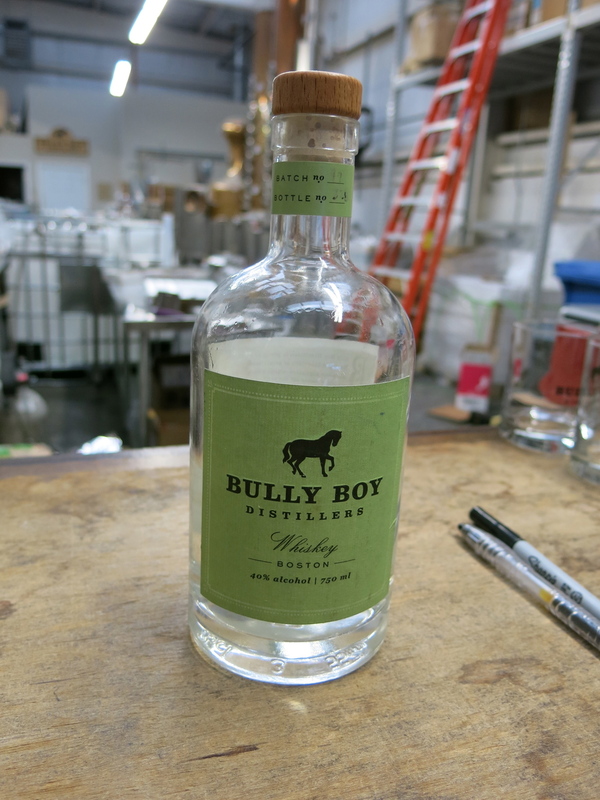 Bully Boy Distillers opened their doors in 2011, the first legal craft distillery to set up shop in Boston in decades. 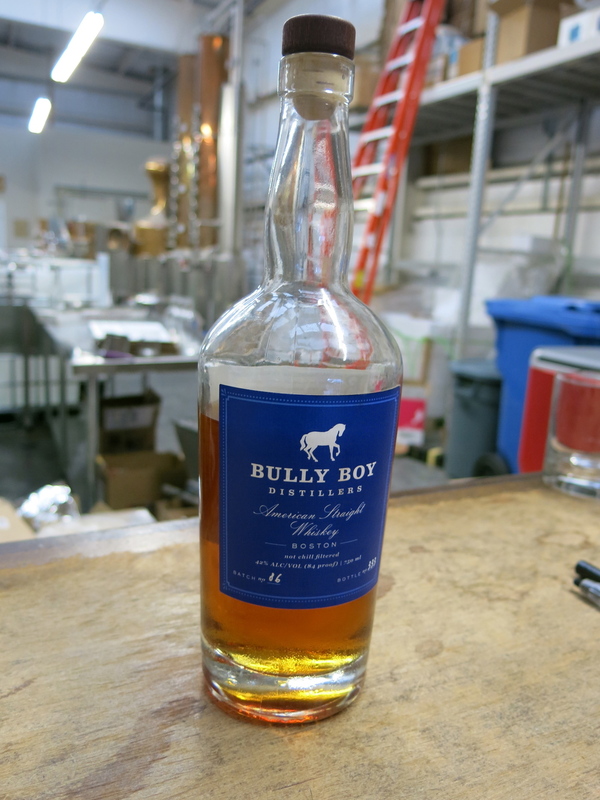 Four years later, Bully Boy is one of the most recognizable liquor brands in the city. Their spirits have become go-to options at a host of local establishments and are integral to any number of signature cocktails. And while their distribution is presently limited to Massachusetts, Rhode Island, and New Hampshire, their growing product line has garnered recognition and praise from across the country – at the front of the distillery is a shelf full of bottles adorned with gold, silver, and bronze medals won in numerous national spirit competitions. Those award-winning spirits are situated just a few yards from the old bootleg bottles, and while they’re oceans apart in terms of quality, it’s not difficult to discern a connection. Growing up on that same Sherborn farm, the Willis brothers experimented with making hard cider before learning the finer points of distillation – using a five-gallon stovetop still. And despite the success they’ve enjoyed in their first four years as professional distillers, the Bully Boy operation remains small in scale, with Will and Dave toiling under fairly harsh conditions. Their utilitarian distillery is in a nondescript warehouse that you won’t find without a reliable GPS unit. 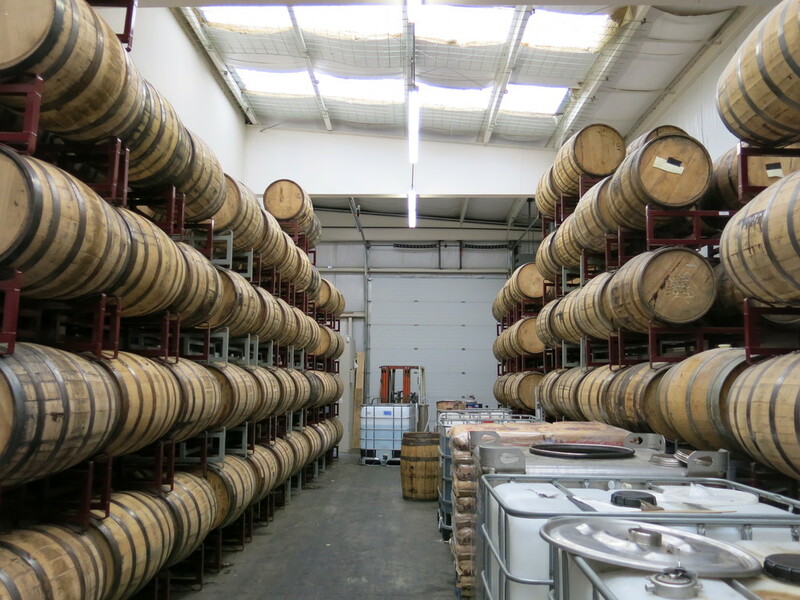 Inside are the tools of the trade, and little more – a 150-gallon still, fermenters, storage containers, empty bottles waiting to be filled, and a room with rows and rows of oak barrels. 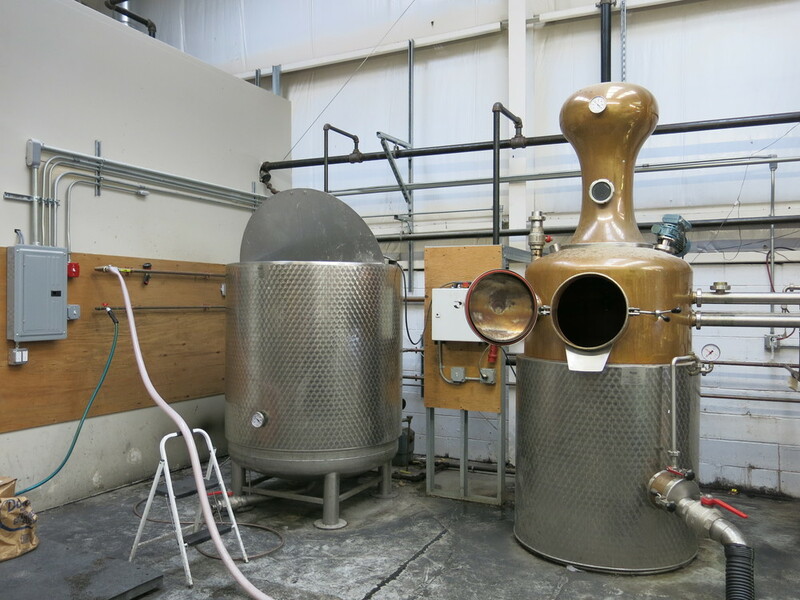 In the summer months, temperatures in the distillery can soar to 120 degrees. Pointing to the barrels, he notes that small quantities of spirit and sap can be seen oozing out of the seams, and he explains the benefits of that presumably sticky process. 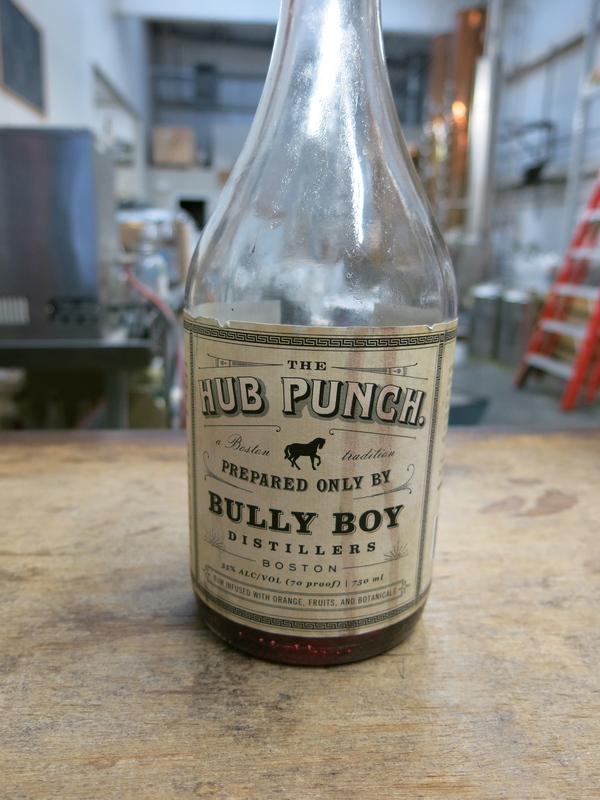 Bully Boy uses each of its barrels twice – first for their American Straight Whiskey, then for their Boston Rum. And while the aging process may seem fairly straightforward, Dave explains that there’s more to it than most people know. After a short lesson on barrels, Dave walks us through the distillation process, from mash tun to fermenter to still, and ultimately, to barrel or bottle. I won’t even try to explain the process in the detail that Dave can, but the tour is entertaining and informative. After that, it’s time to sample the goods. Bully Boy currently offers six products, each made with locally sourced ingredients whenever possible, including Boston water. The tasting begins with their vodka. Using red wheat as a base, the vodka is clean and bracing, with a hint of sweetness, but no burn whatsoever. Made with blackstrap molasses, Bully Boy White Rum is less sweet and more robust than typical white rums, with a distinct fruitiness. Dave explains that white rums have historically gotten a bad rap because of a certain large rum distillery that dominates the global market with a product that’s largely flavor-neutral. 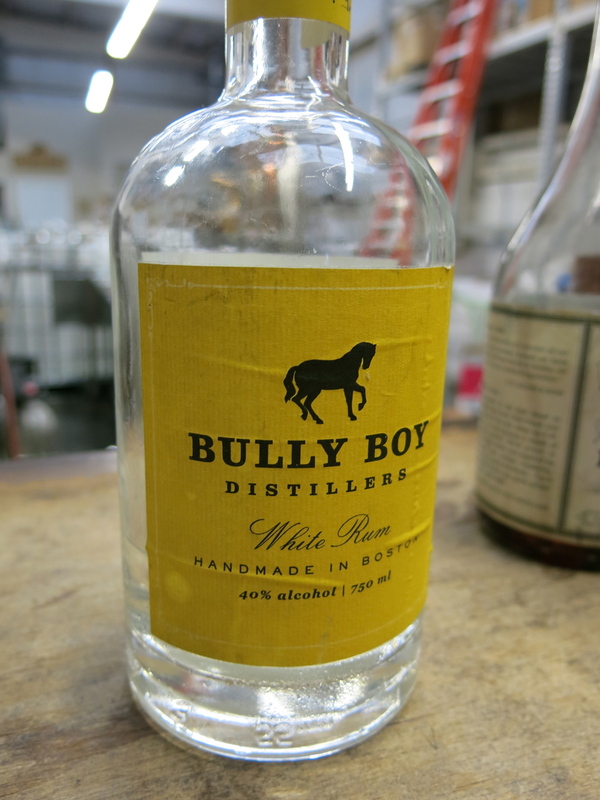 And on that note, Bully Boy’s white whiskey may be their most notable contribution to the world of spirits. 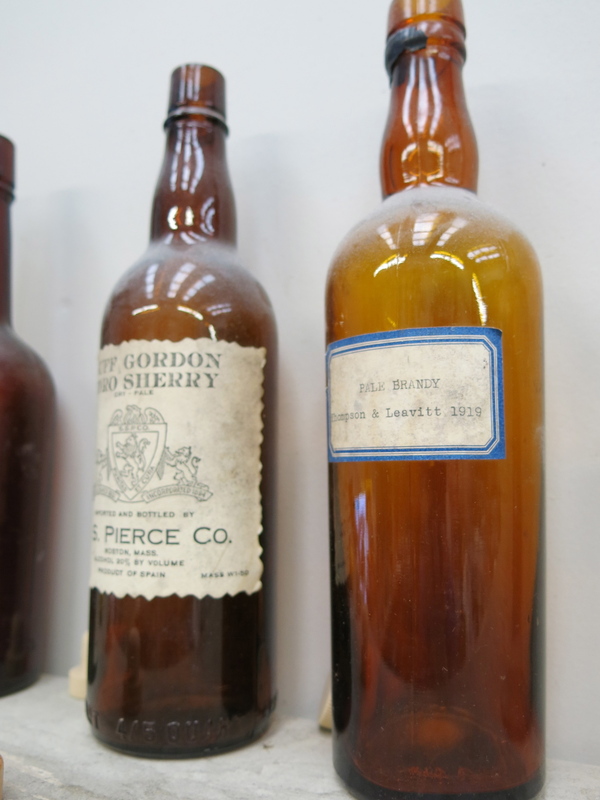 Unaged whiskies had been steadily growing in number and popularity around the time Bully Boy started selling theirs, but most distillers seemed more interested in efficiency than quality. Not having to age the whiskey means saving money and time, and while some producers made quality white whiskies, others just ratcheted up the novelty factor (think corn whiskey and “moonshine” sold in mason jars). Dave explains that the key to making a good white whiskey is treating the spirit differently than one intended for aging. Bully Boy uses wheat for its white whiskey, which is fruitier and more subtle than the typical corn base, and distills the spirit at a higher proof. The result is a clean flavor that pulls from several spirit types, like tequila, gin, and grappa, but still has the graininess of whiskey. While it can be enjoyed neat or on the rocks, Dave thinks of the unaged product as a cocktail whiskey. “There are cocktails you can make with unaged whiskey that you cannot make with any other spirit, so again it’s really adding something to the world of spirits,” he says. 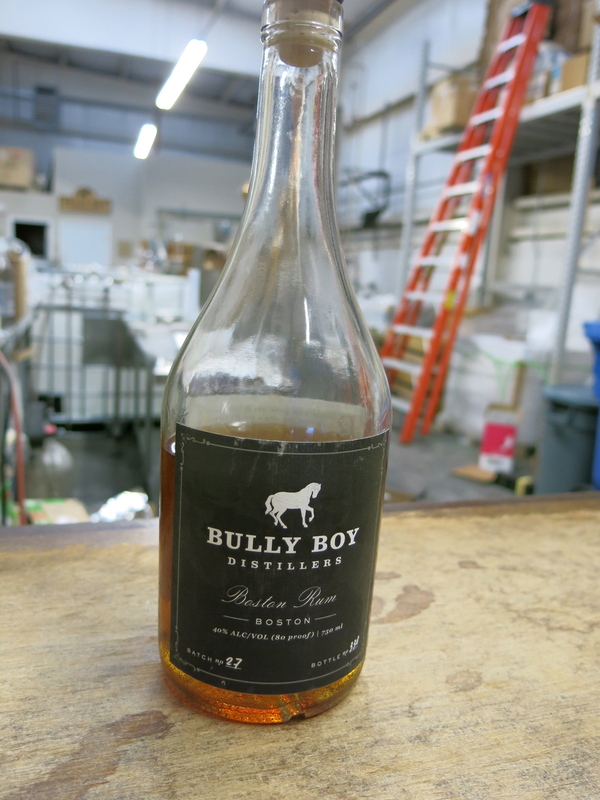 Bully Boy’s American Straight Whiskey, on the other hand, is made with sipping in mind. Aged in American oak barrels, the whiskey’s blend of grains – corn, rye, and malted barley – give it a balanced flavor, with a bourbon-like sweetness up front and spicy rye notes in the back. Bully Boy’s other aged product, Boston Rum, hearkens back to Boston’s pre-Prohibition glory days as a center of rum distillation. Made with blackstrap molasses, it’s lighter and fruitier than typical dark rums, which often have caramel coloring and sugar added to them. The barrel aging contributes some complexity but doesn’t overwhelm the flavor. Finally, the Willis brothers again demonstrate their appreciation for history with one of their more unusual products. Hub Punch is inspired by a recipe that was popular in Boston in the 19th century but slipped into obscurity during Prohibition. Mimicking the lost formula, Bully Boy infuses their Boston Rum with fruits and botanicals for an herbal, fruity spirit, with understated notes of tea and licorice. Dave says it’s best in cocktails, which is how our local forebears apparently consumed it. Mixed with ginger ale, soda water, and lemon, the Hub Punch cocktail is a portal back to Boston drinking culture in the years leading up to Prohibition. The Hub Punch is only the most recent instance of regional history informing Bully Boy’s otherwise modern craft. Even the company name ties back to the family farm. Will and Dave’s great-grandfather named his favorite workhorse “Bully Boy” after a phrase coined by his college roommate – future U.S. president Theodore Roosevelt. And then, of course, there’s that vault of timeworn bootleg liquor. I can’t resist asking Dave my most burning question – has he ever sampled his great-grandfather’s stash? He replies in the negative, explaining that the bottles are in even worse condition than they appear. Most of the corks have degraded and, if you look closely, you can see a layer of sludge at the bottom of the bottles. But by the tone of his voice, I can tell he’s considered it. The contents would certainly be disgusting, and possibly even toxic. And yet, just one sip would be like going back in time. How many people alive today have tried that stuff? Fair enough. And despite Will and Dave’s ties to the past, their future is much more pressing. Next spring they’ll release their first gin, and a wheated bourbon is a few years away. They’re also moving on up – later this year, they’ll be leaving their current distillery for a new, larger facility with more advanced equipment and a tasting room that will overlook the production floor. Dave becomes particularly animated when talking about Bully Boy’s future home, promising it will be a major upgrade from the current environment. And a very long way from a stovetop in their family farmhouse.